Spoon feature:A wide variety of soups, blends, and desserts to meet the needs of different groups of people. The material is plastic, stainless steel, wooden, beautiful in appearance and practical. A small spoon for mixing or eating, stir the soup to make it even or delicious. 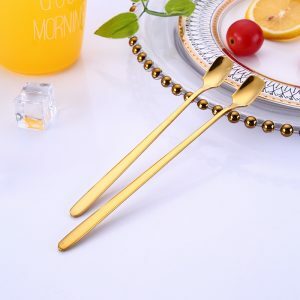 It is a commonly used tableware. Spoons are mainly used for soups, and sometimes they can also be used for slick food. There are mainly plastic, wood, stainless steel, ceramics, and spoons made of plant shells. 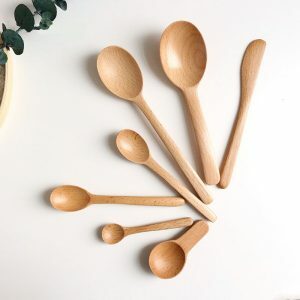 Here, it is particularly important to remind that since spoons are often used to feed infants and young children, when choosing a spoon, try not to choose a stainless steel spoon to avoid burns. 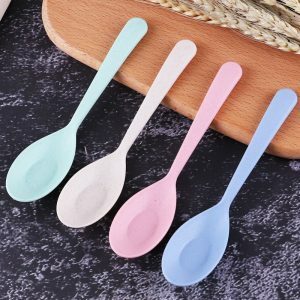 It is best to choose a large brand of plastic spoon. Handheld way. Hold the handle of the handle on the right, with the thumb on it, hold the handle of the spoon, and support the index and middle fingers. 1. When using, do not slam the bowl and make a sound. From the outside to the inside (should eat western food from the inside out), the degree of sputum should be kept at the limit of the bowl and the front of the plate. Do not let the soup drip outside the bowl or plate. 2. Can’t make a sound when drinking soup. Some students don’t pay much attention to this, and their mouths are screaming, which is very vulgar. 3. Don’t blow your mouth to the hot soup. Sometimes the soup on the table is very hot. At this time, you should try some soup first. If it is too hot, pour the soup into the bowl and slowly sip it with a spoon. When the soup is slightly cooled, drink it again. 4. Do not put the soup bowl directly. When the soup in the soup bowl is about to be drained, apply the left-handed bowl and turn the soup bowl slightly, then hold the soup with the right hand. Don’t put the soup bowl up and drink it all. This does not meet the requirements of table manners.